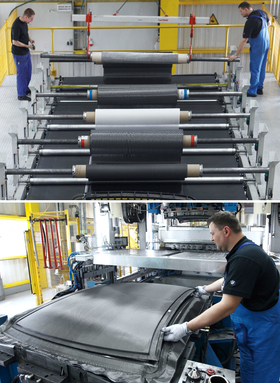 Workers at BMW's plant in Landshut, Germany, layer the carbon fiber roof of the BMW M3. BMW AG plans to begin high-volume production of carbon fiber parts in two years, which could make it the first automaker to move beyond limited-edition use of the exotic material. In 2013, BMW will start building the i3 electric car, a vehicle that features a passenger cell -- the protective shell around the passenger compartment that ensures the integrity of the vehicle in a crash -- made of carbon fiber reinforced plastic. BMW will produce about 30,000 a year, based on estimates from Automotive News Europe. BMW declined to confirm the i3's likely production volume. But Joerg Pohlman, managing director of the joint venture that produces BMW's carbon fiber, said the automaker can produce tens of thousands of vehicles. "We have developed a very flexible production plan," Pohlman said in a telephone interview. "We are prepared to manufacture many more cars if demand is higher than our conservative estimate." In the third quarter of 2011, a factory in Moses Lake, Washington, will start producing carbon fiber thread, which will be shipped to Germany for conversion into the fabric used to make parts. To cut costs and allow mass production, the partners are perfecting a process called resin transfer molding. The carbon fiber fabric is placed in a mold, and resin is injected under high pressure and temperature. The process, which once took 20 minutes per part, now requires less than 10 minutes. Robots cut and handle the material and components, which previously were handmade. The robots will help BMW to achieved big savings. A pound of carbon fiber now costs only a third as much as a pound used in the M3 CSL coupe's roof when the limited-edition car was introduced in the 2004 model year. BMW is experimenting with a vehicle platform with a body structure made from carbon fiber. "For the M3, we could afford to have a few workers put the parts in the form," Pohlman said. "We were only making a few thousand a year. But now we'll be making tens of thousands of parts. So there is a whole lot more automation." Exactly how much does BMW's carbon fiber now cost? Pohlman says only that it's less than $10 a pound -- still pricey compared with steel, but much, much lighter. And Pohlman anticipates big weight reductions. The automaker will use carbon fiber reinforced plastic to form the i3's passenger cell. The frame will be carbon fiber, while the body panels and enclosures will be plastic. Pohlman won't say exactly how much weight will be saved. But he notes that carbon fiber will play a key role in BMW's effort to cancel out the added weight of the i3's battery pack. Battery packs in electric vehicles generally weigh 550 to 770 pounds (about 250kg to 350kg). BMW is not the only automaker that plans to use carbon fiber. Last year Daimler AG announced plans to form a joint venture with Toray Industries Inc., the world's largest carbon fiber producer. In January, Daimler said the partners will use carbon fiber and other lightweight materials to reduce the weight of a vehicle's body-in-white by 10 percent. Daimler also indicated that the partners will produce components for cars to be launched in 2012. The automaker did not indicate which models would feature carbon fiber, but Daimler did hint that it would use carbon fiber in the vehicle's passenger cell. Pohlman vows that BMW will be ready for volume production in 2013. "We are optimizing, optimizing, optimizing," he said. "We are reducing the complexity of the manufacturing process. We have made a dramatic improvement."